Since we’ve been vacationing in the Colorado mountains where my husband bikes 4-5 hours a day and has already logged over 2000 miles, it appears all he’s in the mood to eat is meat. I love meat but just can’t eat it more than once a week. So when he asked me to make a burger the other night before leaving to come home that next day, I said fine but, I wasn’t going to have one. I decided I’d pick up a large portobello mushroom, a red pepper, lettuce, tomatoes and of course some whole wheat buns to put the burgers on. I marinated my mushroom in olive oil, balsamic vinegar, fresh minced garlic and red pepper (cut in 1/2 and seeded), then put all into a zip lock baggie. Prior to doing that I cleaned the mushroom gills. I removed any dirt or debris that might have lodged itself in them. Note: When cleaning mushrooms just use a damp paper towel. Never wash with water since mushrooms will soak the water up like a sponge. Just wet a paper towel and wipe the dirt off. After the veggies had marinated for about 1/2 an hour, I placed the mushroom and red pepper on the grill, skin side down. Once both were cooked to my liking I removed them from the grill and placed them on the bun with lettuce and tomatoes. In addition, I decided since I had some chipotle peppers in adobo sauce, I thought I’d chop that up fine and add it to some fat free mayo that I had, and combined them. It made a delicious dressing to put on my veggie burger and to my surprise my husband loved it as well on his burgers. It had a nice kick to it! Yes he ate several burgers. I don’t know how he does it and stays so skinny but, I suppose with all the miles he’s logged on his bike he needs lots of protein and his protein of choice is red meat. Our meal was delightful, along with some iced cold watermelon that we both love, baked fries and homemade oil and vinegar cole slaw. A simple and delightful meal. Oh and for dessert I went all out (just kidding) and we had Skinny Cow ice cream sandwiches. This meal couldn’t have been easier and it was scrumptious! What’s your favorite burger? I also adore salmon burgers. Please share your recipe. You can never have too many burger recipes! Vicki! This looks incredible! My husband is a carnivore, too! Burgers are some of my favorite foods. I have to admit, I’m a traditionalist and a fan of sliders. I eat vegetarian once a week – and you eat meat once a week. I think if I cook proteins and you cook veggies…we are a complete meal! Beautiful pictures…as always! My kind of burger 🙂 The chipotle peppers with the mayo sounds like a perfect condiment here. Great tips on cleaning the mushrooms! The burger looks amazing! I am an omnivore and eat all. Great post and I love learning a lot from you! That looks like one amazing burger! Thank you for all your comments. When I say I can only eat meat once a week I’m talking about red meat. Most of what I eat though is chicken, fish and veggies. Don’t get me wrong I love meat but the older I get it just sets with me all night. My husband and I use to wonder how the elderly could eat dinner at 4:00pm. Now we know . Food just digests at a much slower rate or so it seems. All the things we have to look forward to. 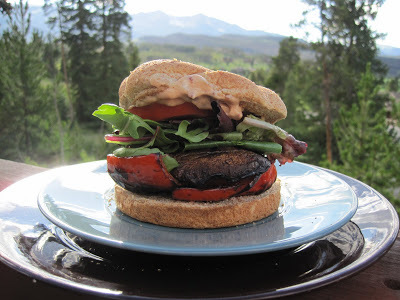 The portobello mushroom burger was great and simple to make. Please try it! Thanks for your posts. Sorry it took so long to reply. Oh now this just looks so delicious!! I am excited to try this!! Thanks for the inspiration. I just can’t believe I won the fabulous watermelon giveaway knife…yeayy!!! Thank you so very much, I am so excited, and so happy, now I have my very own watermelon knife. It’s going to be such a pleasure to cut with it. As it is, we always buy a whole watermelon, and I’m always the one who has to cut it…now it’s going to be so much easier, and enjoyable! Your burger with the portabello mushroom is so delicious, love the chipotle peppers with the mayo on it. Glad you had a great vacation! Please contact me, and I will send you my address. I am not a huge meat eater myself, so this portabella mushroom would work great for me. I have made them before, but never tried them on a bun. Your picture has made me really hungry for one so, today, I am going to go buy me the fixings to make this. Bet my Hubs wants one too. @My Journey with Candida – they are delicious! Try marinating them, it gives it that extra flavor. I’m sure you and your hubby will love them. Oh daaaaahling, I cant have too many burgers. I adore them. My favorite burger is an indian spiced lamb burger (i’ll have to post a recipe), but I also love fish burgers, chicken burgers… everything except bean burgers (because they are so dry). Please share the indian spiced lamb burger! That sounds wonderful.